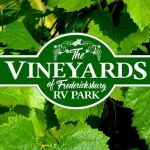 Ask fellow campers about "The Vineyard at Fredericksburg RV Park (formerly Quiet Creek RV Resort" and nearby attractions. We stayed for a week and very clean. Newer park but trees will grow. Park employees were very nice. trash pick up every day. We were there during a rally they were hosting so very full but all was good and kept clean. Will for sure stay here again. We were in site 6 and although we were close to main road we did not hear traffic. Our site was a back in and it was long enough to still be able to open our toy hauler and get bike out without moving. 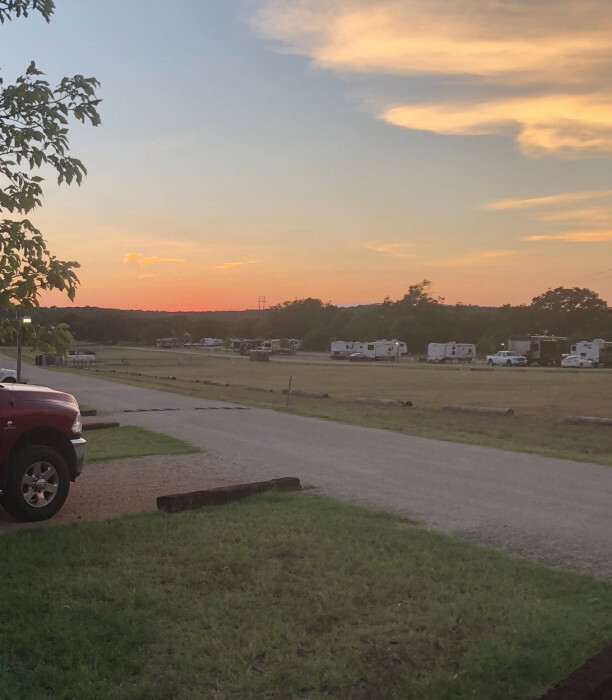 We camped at The Vineyard at Fredericksburg RV Park (formerly Quiet Creek RV Resort in a Motorhome. Newer park with 148 back-in and pull through RV spaces. There is one cabin for rent as well. All sites are fine crushed gravel/stone, FHU with 16 cable channels and picnic table. Interior roads are a mix of asphalt and gravel with quite a few speed bumps, but easy to maneuver with a big rig. There are strips of grass separating sites and a small concrete patio for the picnic table. Park is completely open with no shade since the park is so new and planted trees are very small. We stayed in site 82, a pull through site which was long (85') and nicely level. The park is on a hill, so levelness varies between sites. I suggest getting a site at the rear of the park, as these sites are on flatter ground (i.e. level) and they are also furthest from highway 87 so there will be less road noise. Also, some sites at the front of the park have large wooden barriers (railroad ties?) which would be difficult to avoid when pulling out. Sites at the rear of the park (such as ours) had none of these barriers. 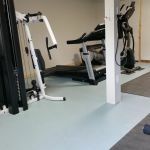 Park has nice amenities such as a pool (not heated), above ground hot tub, off leash dog park, playground, rally hall, gym and outdoor pavilion with grill. There is also a very large grassy area in the middle of the park which includes a soccer field. Nice store on site with a variety of gifts, wine, soft drinks and ice. No RV supplies or snacks however. 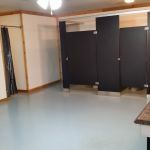 Bathrooms were pristine with 3 toilets and 3 showers per gender. 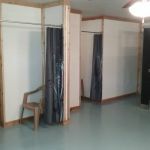 Large laundry area too. Utilities worked well, but neighbor's sewer connection was right next to your picnic table. Verizon signal was excellent. Free secured wifi, but we didn't use. Propane onsite, and you can set your tank outside and they will fill it for you. Daily trash pickup at your site. We enjoyed this park and would stay again. 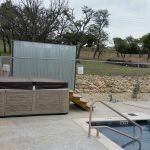 We camped at The Vineyard at Fredericksburg RV Park (formerly Quiet Creek RV Resort in a Fifth Wheel. The park is just north of downtown Fredericksburg which has lots of shopping and dining options. We had german food at Altdorf's which we enjoyed. If you have kids, eat at Mr. Gatti's pizza on highway 16 (about 7 miles away), which has a great buffet and awesome arcade and bumper cars for the kids. Several museums in Fredericksburg as well. HEB and Walmart supercenter were both just a few miles from the park. Big park without a lot of trees. Sites are long enough however have a basic design flaw. The picnic table is on a concrete patio located at the rear of the site. Ours, and most I saw, are about three feet from your neighbors dumper. We had a tree, newly planted and still small between the front of the site and the picnic table. This prevented us from extending our awning. The solution would be to reverse the location of the patio and the tree. The tree probably won't mind being next to the sewer connection. There are also old rail road ties as edging for the site. The fifth wheel next to me hit it on the way out. If the site entrance/exit was tapered, it would be an improvement. Other than these flaws, the park is very good. Access is excellent, the interior roads are wide (have speed bumps though). The check in was quick. There is enough room for two big or three small RVs to park for check in. The on site laundry was clean, had 5-6 machines. Camp host pick up trash at your site although dumpsters are located in the middle of the park. Propane is available on site. Dog park looked good too. Pool and Gym was open but we weren't there long enough to try it out. This would be a great park for a caravan or group rally stop. We camped at The Vineyard at Fredericksburg RV Park (formerly Quiet Creek RV Resort in a Motorhome. Enchanted Rock SP is worth a visit. You need to make a reservation on line or the park workers will turn you away at the gate. It was a difficult to make a reservation with a mobile phone. Lap top or tablet might work better. Several friends told us to visit "The Nimitz Museum" while we were there. The actual name is the National Museum of the Pacific War, which is huge and must do! It includes the Admiral Nimitz Museum, which is located in the old Nimitz Hotel. This is a nice park, we think it is one of the better parks in Fredericksburg area. The sites are long the services are in the middle. The sites are gravel and nicely spaced the main roads are gravel. It is easy for big rigs to get around. The negative on the roads are the speed bumps however it does keep the speed down. They have added a play area for the kids and have a nice field area in the center for pets or people to walk. They have a good laundry, showers and bathrooms. It is outside side the city a short distance but we like it because it is quiet. We will be back again. 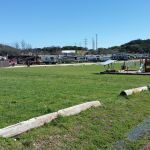 We camped at The Vineyard at Fredericksburg RV Park (formerly Quiet Creek RV Resort in a Fifth Wheel. 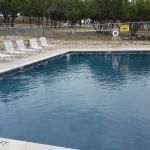 This is a clean, well-maintained RV Park, big-rig friendly with lots of amenities (pool, jacuzzi, laundry, exercise room, cable TV, etc.). Interior roads are hard-surfaced; sites are long, gravel pull-throughs, not too tight, with grass in between; little or no shade. Our site, at the front of the park, required leveling, and there was some road noise from Hwy. 87; sites farther down the hill appeared more level, and were probably more quiet. 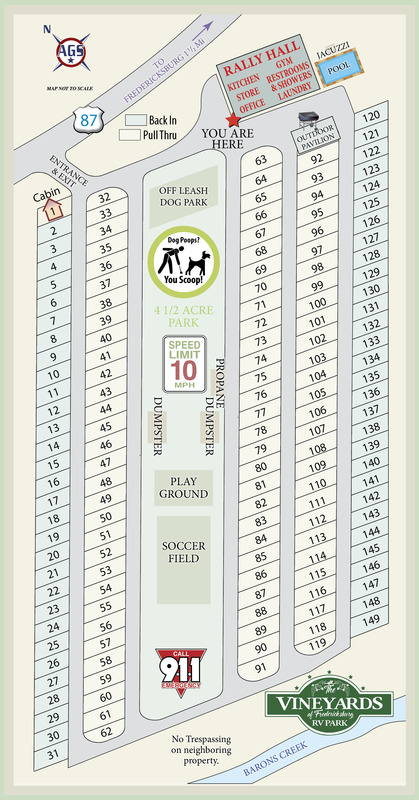 We requested a site near the large, fenced dog run with grass; which more than made up for a little road noise. We would stay here again. 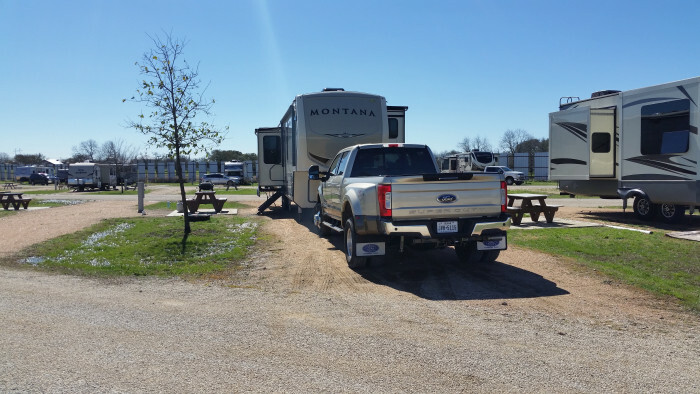 We camped at The Vineyard at Fredericksburg RV Park (formerly Quiet Creek RV Resort in a Fifth Wheel. 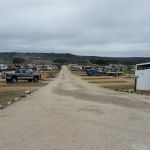 Great new RV Park just 3 miles west of Fredericksburg, TX. The facility is on a downslope but the sites are leveled for the most part. Big Rig access, great roads and wide / long sites. WiFi was ok but not great. We never got the Cable TV to work due to the digital signal format they use. Dish Network satellite works great because there is not a tree on the property which would be in issue in July - no shade. We are T-Mobile cell users and this part is just outside of the range of the tower in Fredericksburg so we were on LTE roaming which didn't work well. We would definitely recommend this park and stay there again. 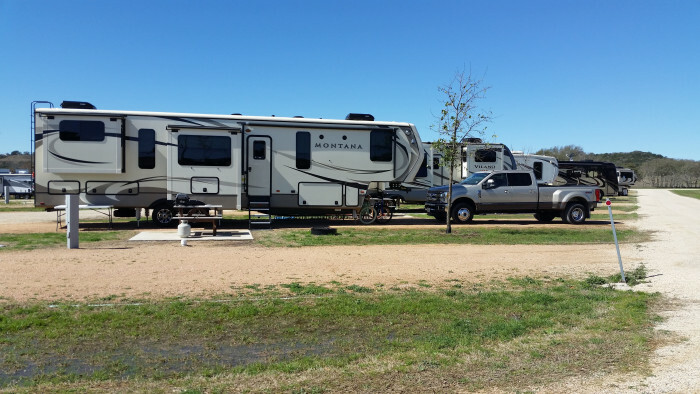 We camped at The Vineyard at Fredericksburg RV Park (formerly Quiet Creek RV Resort in a Fifth Wheel. We were here first for a rally and then later on our own. Excellent park with easy access for big rigs. The room they have for rallies was also excellent and they did a great job in making the rally go smoothly. 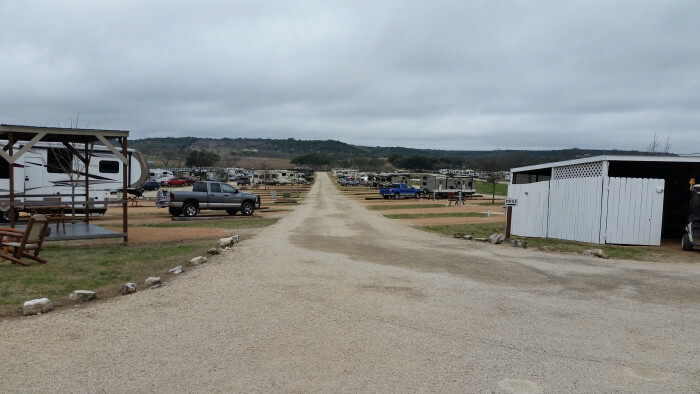 We camped at The Vineyard at Fredericksburg RV Park (formerly Quiet Creek RV Resort in a Motorhome. Very long pull-throughs in this large, quiet park. Clean laundry room. Nice shop in office. Beautiful sunsets. Friendly owner. 2 miles to downtown. 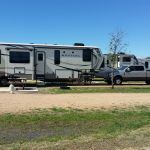 We camped at The Vineyard at Fredericksburg RV Park (formerly Quiet Creek RV Resort in a Fifth Wheel. We stayed here during Memorial weekend and would not hesitate to come back. Very nice park and easy to navigate. What I did not like is that they use something called RoverPass to make online reservations. I didn't realize at the time that I would be charged $30 for this "service." Felt that was a ripoff. Parks should pay for this, not the consumer. 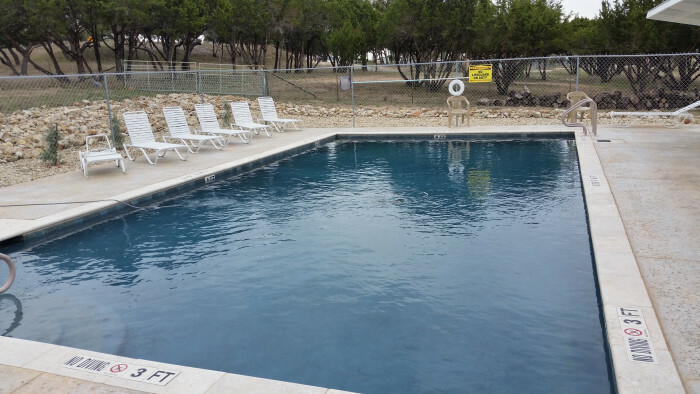 We camped at The Vineyard at Fredericksburg RV Park (formerly Quiet Creek RV Resort in a Motorhome. Don't use the online reservation system. This is a fairly new park so there is good news and bad news. Everything works and the sites are plenty long to park anything. Very easy in and out. Site spacing is wide enough for slides and awnings. Grass is getting fairly well established but not like a mature park. There is no shade except maybe on the West of one side where there is a row of long-termers. The park is on a gentle slope and they could have done a better job of leveling the sites. Ours was off but within the capability of the jacks. The gravel parking areas are not well compacted by use yet so jacks will sink in if it rains. I put boards under mine and the boards pushed a good inch into the ground after a hard rain. The puddle in the grass outside the door took a couple of days to dry up. Park is outside of town on a busy highway with lots of traffic during the day but not too bad at night. Strong Verizon signal. 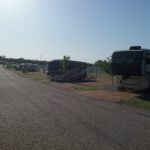 We camped at The Vineyard at Fredericksburg RV Park (formerly Quiet Creek RV Resort in a Motorhome. Arrived after the office was closed and we got our paper work and site number in the office mail box. I was given a gravel pull thru that was easy in/out with 50 Amp FHU. The site has a small concrete pad w/picnic table. The sites are plenty long and wide enough. It is a big park that is in the open, so we used our dish. The wifi worked well and I didn't have to go far for the trash. The park looks well kept. The showers and laundry are spotless. I would stop here again. 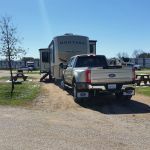 We camped at The Vineyard at Fredericksburg RV Park (formerly Quiet Creek RV Resort in a Fifth Wheel. The park is just west of town. It is a very nice town with lots of shops and things to do in town. We made reservations online. $90 deposit required, in other words full prepay. Never had that experience. I put the address in our GPS and then we were completely confused because the sign said The Vineyards at Fredericksburg, nothing about Quiet Creek RV Park. We ended up going by it and then turning around (not that easy), pulling in and asking another resident if we were in right place. Yes, name change! Check in was easy and our site was perfect, way to the back so no road noise. 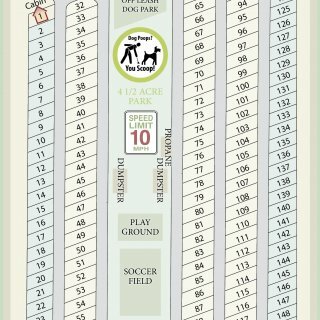 They have a nice grassy area in the middle of the park and a great fenced dog area. WIFI was decent, quieter slow but we have come to expect this now that everyone has a device or two or three! We use satellite so did't attempt cable hook up but it appears people have had issues with it. As others have mentioned, the placement of the picnic table is very odd. Way to the rear on a concrete slab and you are basically sitting next to your neighbors sewer hookup. We didn't use for that reason and admonishments about putting anything in the grass kept us from moving it! My only complaint is the confusion about the name. A simple email advising this would have saved us some anxiety at the end of a long driving day as others have mentioned, the entrance is at the top of the hill as it changes to two lanes so use caution n. We camped at The Vineyard at Fredericksburg RV Park (formerly Quiet Creek RV Resort in a Motorhome. A huge park. Well set out and site level. Roads were very good. Not to far from the center of downtown. Wifi was ok but dropped out a fair bit. Staff was friendly and efficient. Very easy to miss the entrance as the road drops off. 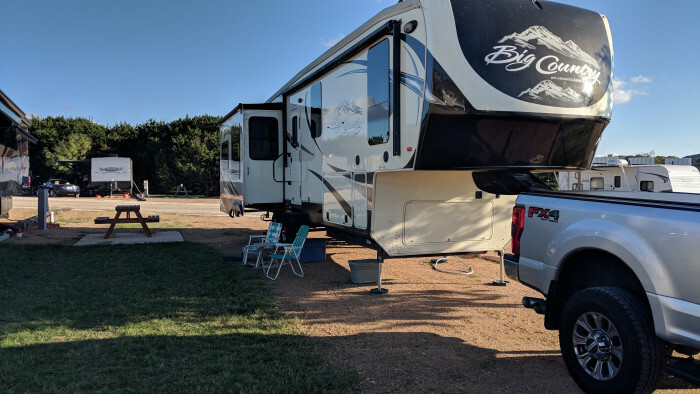 We camped at The Vineyard at Fredericksburg RV Park (formerly Quiet Creek RV Resort in a Motorhome. Very nice new RV Resort. WiFi is strong, the sites are clean and spacious. I give this resort 2 thumbs up!!! 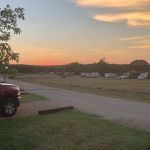 We camped at The Vineyard at Fredericksburg RV Park (formerly Quiet Creek RV Resort in a Motorhome. Our pull through site was exceedingly long with plenty of room. Our site was level and the surface was gravel with a nice large plot of grass and a young tree. We also had a concrete patio with a small picnic table. We camped at The Vineyard at Fredericksburg RV Park (formerly Quiet Creek RV Resort in a Motorhome. Park was conveniently located on the north west side of town about 2 miles out on highway 87. We would not hesitate to host a large rally at this resort. Stay towards the top/front of the park if you can. The entire park is on a slight incline and there are no facilities at the back end of the park. The Quiet Creek staff have information for just about any and all questions. The location (on the north/west end of town) made it EASY to get to any and all points of interest and restaurants and shops. Fredricksburg is a fantastic town to visit. This was our 5th visit. Great downtown area, lots of wineries in the area, and of course Luckenbach. Much to do in Fredericksburg including some great resturants. Nice to see a smaller town that is thriving, as so many today look like an image from the movie, "The Last Picture Show". 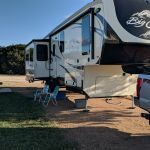 LBJ State Park & LBJ National Park are a must see and everything is free except the tour of the Western Whitehouse, go to Luchenbach, Enchanted Rock, plenty of wineries, & German Biergardens; never a lack of anything to do. We ate at Aushlanders; excellent German food and atmosphere. I would also recommend visiting Enchanted Rock State Park while you are here. You can hike the big rock or the shorter trails, its beautiful. Lots of things to do in Fredericksburg! The National Museum of the Pacific War is a must see! Love all the shops on the main street and local wineries. Two restaurants we enjoyed were: West End Pizza Company and Altdorf Biergarten. There's lots to do in Fredericksburg. Check out the Nimitz Museum. It's amazing. Don't forget the Wildseed Farm. Nearby Fredricksburg is a quaint little town of German immigrant heritage dating back to mid 1800's. There are lots of unique shops, good restaurants and great beer gardens. Twenty-five minutes east is the home/ranch of President L B Johnson as well as a historic neighboring home/farm where docents dressed and taught in the period of late 19th century. In town is a historic village depicting the lives of early German settlers. A must see is Enchanted Rock State Park. Great hiking area on a cooler day. LBJ Ranch is another must see site. A tour of the ranch house was only $3.00 a person. LBJ National Historic Park (LBJ ranch) and National Museum of the Pacific War definitely worth a visit. Many good restaurants in Fredericksburg. Entrance to the park is right where 87 goes back to 2 lanes and speed limit increases to 70 right as you come over the hill. Lots of things to see and do in Fredericksburg and there are lots of wineries in the area. Not very far from LBJ Ranch. Fredericksburg is a great place to visit, museums, shops and beautiful Texas hill country. The town has a strong German heritage. 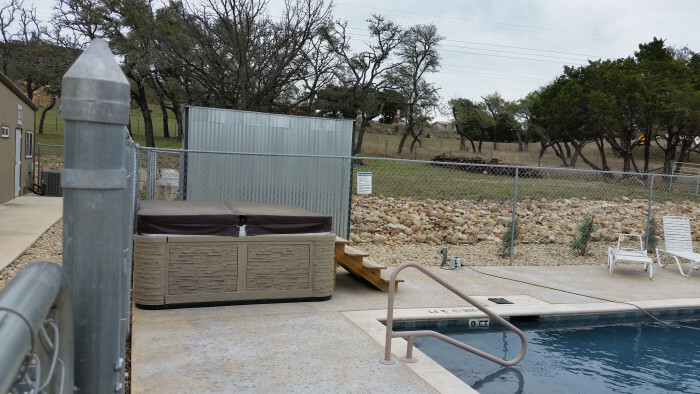 Are you affiliated with The Vineyard at Fredericksburg RV Park (formerly Quiet Creek RV Resort ?